Get the support of this elusive councilor. Travel to the Haunted Manor in St. Olms Canton and pick the lock. Speak to Dram Bero to learn his conditions for his support. Talk to Dram Bero for his support. Crassius Curio in his manor in Vivec will ask you to get the support of another Hlaalu councilor, Dram Bero. Unfortunately, Dram is hard to find, though Curio suggests to start looking in Vivec. If you ask around, you'll eventually be directed to the St. Olms Plaza. A simple search of the level will reveal nothing, except possibly a well locked door in the Haunted Manor. Inside you'll find Bero and you can get his support by talking with him, though you'll need to take out his champion, Garding the Bold, first (he doesn't want you to kill him, so either use Hand-to-hand, a Drain Fatigue spell, or wait until Garding concedes when he is low on health). Once you defeat Garding return to Bero to gain his support and complete the quest. If you kill Garding, Bero will still support your nomination but will be disappointed at the death of his champion causing his disposition to drop rather than increase ten points. Return to Crassius for the next quest. If you kill Garding the Bold "without provocation" (i.e., before the Arena challenge begins), Bero will not support you. If you kill him in the Arena, Bero will support you, with the disposition drop noted above. 10 Crassius told me that I should get the support of another Hlaalu Councilman. 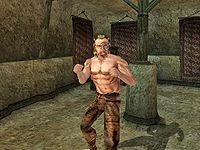 I should try and find Dram Bero in Vivec and get his support. 30 I was told that Dram Bero lives somewhere in the St. Olms Canton. 40 I was told that Dram Bero has been seen going in and out of one of the manors at the top of the St. Olms Canton. 50 Dram Bero agreed to support me if I can best his champion. I must defeat Dram Bero's champion, Garding the Bold, but not kill him. I can knock him out or fight him to a draw. 70 I defeated Dram Bero's champion, Garding the Bold. 100 Finishes quest Dram Bero agreed to give me his support on the council. 200 Finishes quest I killed Dram Bero's champion, Garding the Bold. This page was last modified on 13 May 2017, at 04:02.